The PF-3 pool photometer is part of the smallest member of the MACHEREY-NAGEL photometer family, providing a really handy way of carrying out site measurements. It is simple and intuitive to use with just four buttons. Strong enough to resist the rigours of site work with shock resistant optics, reinforced housing and IP 68 rating. Swimming pools are important areas of recreation and relaxation. To constantly provide highest quality water and a safe user environment, the water within swimming pools has to be treated, conditioned and closely monitored. 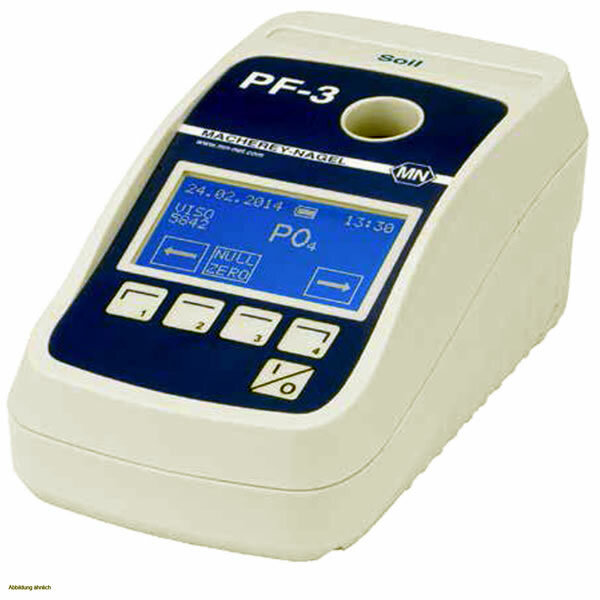 For reliable and easy water analysis for swimming pools, the PF-3 is the perfect tool. The built-in LEDs allow quality control personnel to analyze the classic swimming pool parameters chlorine, pH, cyanuric acid and total alkalinity, as well as a selection of additional parameters, thus providing fundamental and vital information on pool water quality. The PF-3 and VISOCOLOR® ECO tests combine convenient handling for reliable test procedures and results as well as safe handling for convenient and efficient daily pool water analysis.